A dull silver cross encrusted with tiny rhinestones and orange beads. 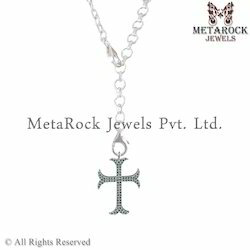 Crystal studded cross with collar chains in silver. Celtic Cross Pewter Pendant With Black PVC Cord Necklace.